Next week, we begin our nearly non-stop journey through the arts that is the 18th Annual National Queer Arts Festival! This year’s festival theme is Connections. We asked artists to explore the connections we make internally, individually, collectively and in community and to investigate the sinews that hold them together and the forces that break them apart. Our artists met the challenge of this theme in a wild variety of ways resulting in thrilling circus, readings, performances, comedy and music. I can promise you a unique experience…and some serious fun! Founded in 1993, Queer Cultural Center (Qcc) is a multiracial community-building organization that fosters the artistic, economic and cultural development of San Francisco’s LGBT community. Since 1998, QCC has organized an annual month-long National Queer Arts Festival. To date, these Festivals have presented more than 800 different events featuring over 1000 Queer artists. The festival is the largest queer arts festivals in North America. This year the exhibition GLITTER BOMB explores the idea of physical, social, political, affective and historical connections. For those who have been denied acceptance into existing social models and access to traditional political means, or for those who voluntarily reject these structures, queers have created alternative social connections as sites of political transformation or contestation. Curatorial Committee: Darius, Bost, Việt Lê, Rudy Lemcke, Matt McKinley, Jackie Francis and Pam Peniston. Join the Queer Cultural Center and the artists for the official opening party of the National Queer Arts Festival. Dress in your finest/freakiest/most fabulous outfit and come meet Festival artists and surprise guests! 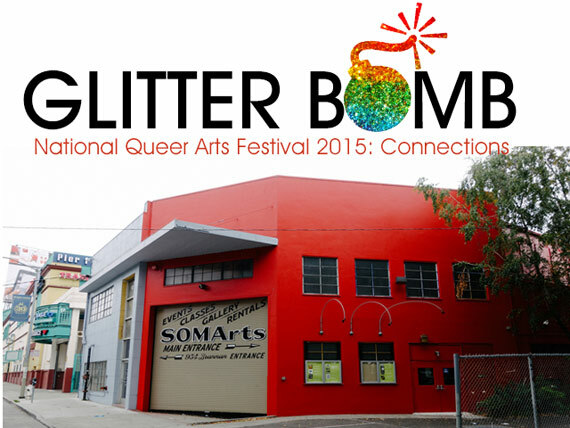 Glitter Bomb explores how queers bond, connect, and create alternative models for social interaction and political transformation. The visual artists look to past models of queer social connection and dream new ways of connecting that reflect the urgency of social justice movements.